Blade Insert into Oval Tapered Shaft, there is hot glue on the Palm handle tube, pls kindly cut the paddle shaft to your length, and then fix the handle by heating the hot glue with hot air gun/hair drier. (1), Aluminum alloy mold for all the carbon fiber blades. (2), The Carbon blade is made by Hand laying-up, One Step Forming, With PMI foam inside which is shaped by CNC machine. (3), the carbon paddle blades are without Paint Spraying finish, Without Clear coated process (other suppliers use PU foam for blades and cover the defects by paint spraying finish). (4), It is Oval/elliplic Carbon Shaft with Palm handle. 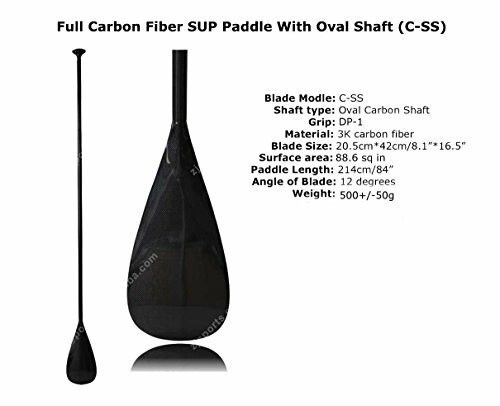 This stand up paddle is in a special promotion now, buy one pc stand up paddle get a FREE carbon handle. You just need to Click the “Add both to Cart” button in the promotion description. The value of the Bonus item will be reflected on the final order checkout page and discounted proportionally from the price of all promotion items in the Shopping Cart, including the Bonus item itself. Please kindly notice that there is no hotglue inside of the FREE handle, thank you.